Celebrations of Love are our thing! Bloaum Studio offer a fully bespoke Wedding flower service. So whether you are having an intimate gathering, a large scale ceremony or even eloping we can work with you to create tailor made florals to suit. Please check out our specific Weddings section to read more about what we can do for you and get in touch to start talking all things flowery! We offer bespoke florals for all kinds of events & installations, from editorials, supper clubs, corporate parties, product launches, wedding fairs, blogger events, art exhibits, shop windows, film sets. Just contact us with your initial idea & we will get to work; the more creative the better, we love nothing more than bringing a concept to life! Need Floral & Botanical Styling for FASHION / LIFESTYLE / BRIDAL photoshoots, editorials , shows & events. No matter what the occasion we can help inject some natural elements that bring your project to life. 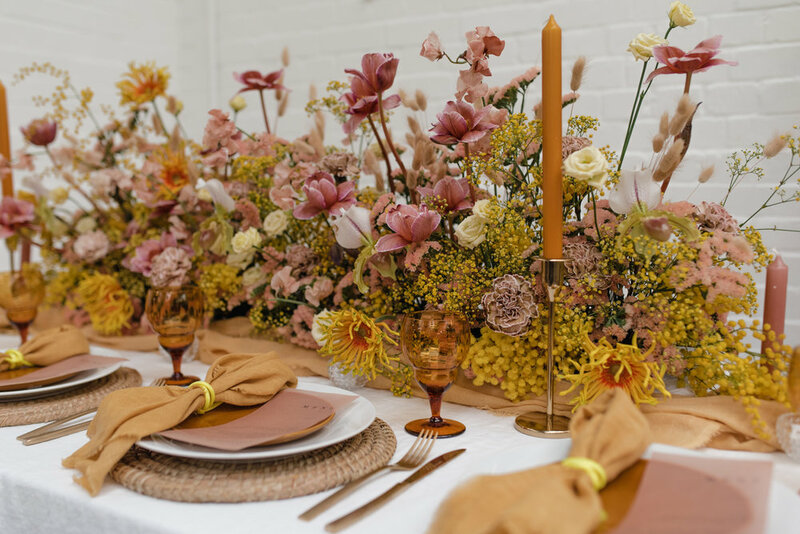 Whether you’re looking for florals to take centre stage or make a subtle finishing touch, we will share our knowledge and stylistic eye to make tailored suggestions and collaborate with you every step of the way. Want to learn or develop a new skill? Have fun with your friends or colleagues? Or simply indulge in some ‘me-time’ for a few hours of mindful creativity? We offer a variety of bespoke floral & botanical group workshops for private parties, hen-do’s, celebrations, corporate/team building, seasonal events & festivals. We are happy to travel to you or equally you can leave it to us to source a suitable venue to host your group. Our most popular workshops include creating; Flower crowns, Hand-Tied Bouquets & Seasonal Wreaths. In our workshops you will be given expert tuition, insider tips + inspiration and supplied with all the materials needed to make your own beautiful floral creation. We are also open to joining other creatives businesses in putting together collaborative day retreats & workshops. In the past we have joined forces with yoga studios, macrame artists & photographers to create unique events. We can provide a weekly/fortnightly delivery of flowers for business or home across East Sussex and London. Bring a touch of the outside in & beautify your workspace or home with the scent and colour of fresh flowers.